Specially designed for Fitbit Charge 2 Only, Tracker is NOT included. Personalized Your Fitbit Charge 2 smartwatch with this refined replacement premium stainless steel wristband, milanese strap makes your Fitbit Charge 2 a totally new classic and pleasant look. 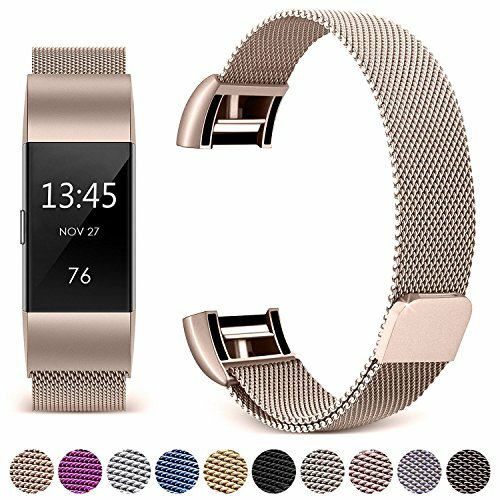 Premium 316L stainless steel material with solid wire mesh and magnetic Milanese loop, it is comfortable, eco-friendly and safe for human skin. Great craftsmanship, elegent and luxury, but in affordable price. Fits for 5.5 inch -- 8.1 inch wrist. Fully magnetic clasp design -- Free adjustable length that you can adjust according to the circumstance of individual wrist, securely and convenient to put on or take off. - Exclusive Aluminium Alloy clasp and steel head, easy to install and remove. - Compact design, lightweight, breathable and flexible. - Many colors for your preferences, Black, Silver, Rose Gold, Gold, Blue, Brown, Purple. Suitable for all kinds of people. - Eco-friendly, low-key, elegant and practical. No Deformed & No Faded. Best spare or gift for yourself, your family or friends ! Clean with soft wet cloth. Do Not soak in water for long time. Updated Solid Version: Unique Technology of Hotodeal, different from other milanese straps, Hotodeal bands update the magnetic buckle, making it possible to detach the buckle from the lock freely. You may across into the band directly or put on the strap by locking it. No need of choosing small or large size, for it has a size ranges from 5.5" to 8.1", which is suitable for all wrists. Easy Loosening and Tightening & Safe Wearing: Metal connectors perfectly fit your tracker and the band seamlessly perfect for your Fitbit. Gently press the metal spring and a crisp click indicates a strong connection, no worry for the dropping of your Fitbit. Multiple Color Choices: Excellent galvanization gives Hotodeal a unique style, with various color choices: silver, black, rose pink, colorful, gold, rose gold, coffee, champagne, blue, purple...Hotodeal makes your life more colorful. After Sales Service & Attentions: All of the straps are galvanized except from the silver ones. To avoid color fading and scratches, please keep it away from direct sun exposure and sharps, do Not soak in water for long time. All of our products are under a 3-months warranty, if any quality problems occurred during this period, we will offer unconditional replacement or refund. For any problems, please feel free to contact us. If you have any questions about this product by Hotodeal, contact us by completing and submitting the form below. If you are looking for a specif part number, please include it with your message.